Posted on May 15, 2014 by Clare Cooks! I really like teriyaki sauce. I used to really like the one Soyaki from Trader Joe’s and while there are some gluten-free teriyaki sauces available, there aren’t any that aren’t too sweet and with the chunks of garlic and ginger. To remedy this random and very specific teriyaki craving, I decided to make my own! And as far as I can remember this was a pretty close replica of the teriyaki sauce I’ve been missing. I also recommend baking your meatballs. Baking them makes way less of a mess to clean up and it’s healthier than frying them too. 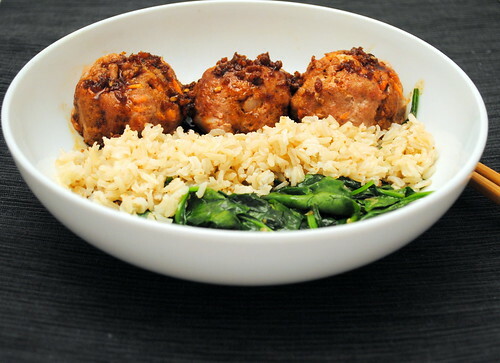 I served my meatballs with brown rice and spinach sautéed with garlic. The teriyaki sauce was fantastic with the rice and spinach as well as the meatballs. In a large bowl, combine turkey, carrot, green onions, cilantro, breadcrumbs, chile sauce and egg. Gently mix to combine and form into 1 to 1 1/2 inch meatballs. Place meatballs on a parchment lined, rimmed baking sheet. Bake at 350 degrees for 25-30 minutes until meatballs are cooked through. Posted on May 14, 2014 by Clare Cooks! My wonderful friend Andrea introduced me to this meal when I was visiting her and her husband in DC last summer. It was love at first bite. She also introduced me to my first food blog (Smitten Kitchen), so I really have a lot to thank her for. This recipe also happens to be from Smitten Kitchen (did everything just come full circle?). This meal is one of my all-time favorite summer time dishes. The ingredient list and instructions might look a bit long and daunting, but once all the chopping and slicing is finished, it’s pretty easy to get together. I will be quite honest and admit there are a few things in here that I would never be caught eating by themselves (I’m looking at you cucumbers! 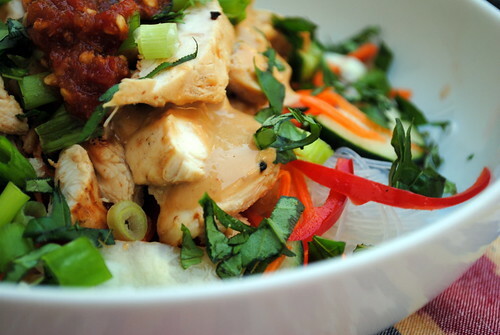 ), but put them all together with some peanut sauce, cilantro, and lime, it’s hard not to like everything in this meal. Despite my reservations about cucumbers (and bell peppers too), I left the recipe nearly all the same, except for using chicken breasts and all gluten-free ingredients. I also used more cilantro than mint and basil, but that’s just because I love cilantro (I’m lukewarm on basil and barely acquaintances with mint). Luckily, just about everything in this recipe can be adjusted to every individual taste. When you serve this delicious meal up, it’s kind of like a noodle-taco bar scenario. Everything is prepared separately and you get to pick and choose what you do and don’t like, which makes it good for a small crowd. And I am happy to report that this meal is one that gets better with age. The leftovers are even better than the original meal! Whisk ingredients in a small serving bowl, making sure to dissolve the sugar. Leave to ripen for 15 minutes. Refrigerate any extra and use within a few days. In a blender or food processor, puree all ingredients to a smooth sauce, about the thickness of heavy cream. Pour into a serving bowl. Stir together 1/2 the dipping sauce and 1/3 the peanut dressing (you can eyeball this) in the bottom of a low-sided bowl or dish. Add the chicken to the mixture and toss to coat. Let marinate at least 15 minutes. Bring a large pot of water to the boil, then turn off the heat. 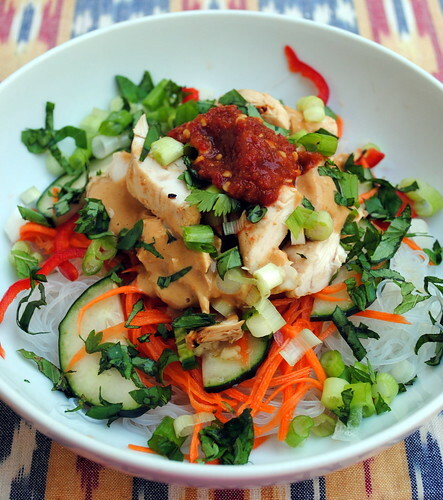 Add the rice vermicelli and soak for 7 to 8 minutes. (Package directions may vary; check for doneness by tasting.) Drain when noodles are al dente, and cool under running water. Fluff and leave in strainer to drain well. Grill the chicken on an outdoor grill, a stove-top grill pan, or run under the broiler until nicely browned, about 3 to 4 minutes a side. Let cool slightly, then chop roughly into 3/4-inch pieces. At this point, you can place everything on a large serving platter, with piles or small bowls for noodles, vegetables, chicken, the dressing and marinade and toppings (peanuts, herbs) and let your family and friends put it together in their own bowls as they wish. Or, you can assemble it for everyone as suggested:Toss vegetables with 1 tablespoon dipping sauce in a small bowl. Divide the cooked noodles among 4 to 6 bowls. Top each bowl equally with vegetable mixture and chopped chicken. Toss each bowl with 2 teaspoons of each the dipping sauce and dressing, or more to taste (we wanted more). Add the herbs, peanuts and scallions to each bowl and serve with additional dressing and dipping sauce on the side. Posted on May 13, 2014 by Clare Cooks! Sticking with this week’s loosely Asian inspired theme, this is a fairly quick , easy and very delicious recipe. 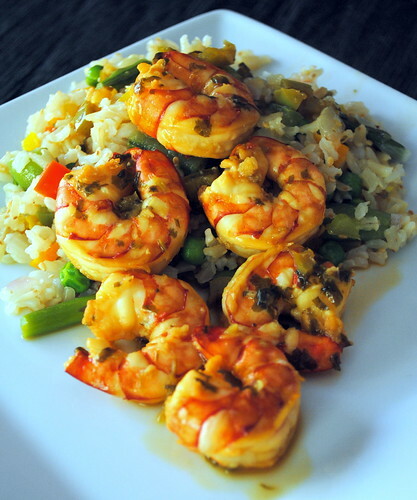 The shrimp stir-fry makes for a quick meal and is great for a weeknight meal. These shrimp are absolutely delicious. I thought the shrimp and their sauce was the perfect topping for the fried rice, but noodles or even a salad could work just as well. I used this recipe to clean out my vegetable door. I just used whatever I had on hand, but you can use any veggies you want. Shrimp adapted from this recipe from Chow. Preheat a large skillet or wok to medium heat. Add sesame oil. When oil is heated onion, garlic, bell peppers, peas and carrots and sauté until tender. 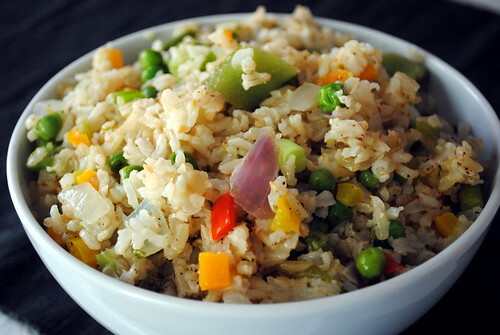 Add the rice to the veggie mixture. Pour the soy sauce on top. Stir and fry the rice and veggie mixture until heated through and combined. Top chopped green onions and sesame seeds and serve. Place the soy sauce, garlic, jalapeños, cilantro, lime juice, oil, and sugar in a shallow dish and stir to combine. Add the shrimp and lemongrass and stir to coat. Let marinate for 10 minutes at room temperature. Heat a large frying pan over high heat until hot, about 3 minutes. Add the shrimp mixture and cook until the shrimp are bright pink, about 3 minutes. Remove from heat and carefully add the vodka. Return the pan to high heat and cook for 1 minute more or until the alcohol smell has dissipated. Remove the lemongrass pieces and serve the shrimp and sauce over rice. Posted on March 5, 2012 by Clare Cooks! Edamame might be one of my favorite appetizers. As much as I love sushi, the edamame is always highlight of most of my sushi meals. My favorite sushi restaurant in Santa Barbara (Edomasa) has the best spicy edamame. I have been wanting to attempt to replicate their recipe for a while now. 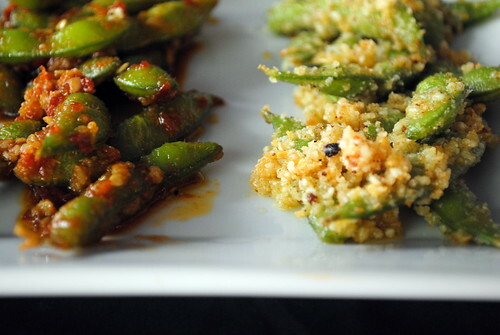 The combination of garlic and chili and edamame is a definite winner in my book. After making my version, I’m fairly certain that they use garlic and chili powder as opposed to fresh garlic and sriracha. Either way, the end result is absolutely delicious. 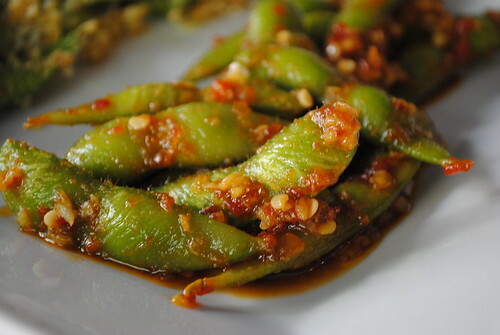 The spicy sauce on the edamame would be amazing on just about anything you would want to spicy up. I will admit that parmesan garlic edamame will probably not be appearing on any sushi house menus anytime soon, but parmesan and garlic just make everything better, including edamame. This parm garlic combo is just as versatile as the spicy chili sauce. It would be great on top of roasted asparagus, green beans, broccoli. Prepare edamame according to package. In a saucepan, heat olive oil over medium heat. Add garlic and cook for 2 minutes. Next add the chili sauce and tamari/soy sauce and stir together. Pour sauce over edamame. Serve immediately. In a small food processor, pulse olive oil and garlic together until well combined. Heat garlic oil in a saucepan over medium heat. Stir in edamame and stir to coat. Add in parmesan cheese and bread crumbs and stir again to combine. 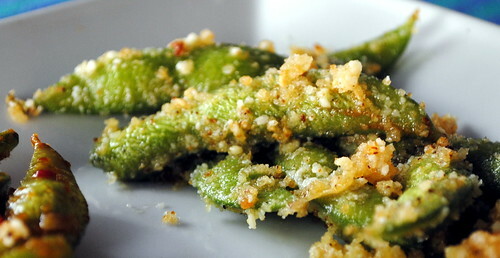 Remove edamame from sauce pan and top with sea salt and freshly ground black pepper to taste. Posted on November 2, 2011 by Clare Cooks! This was a quick and easy side quasi-based on stir fried tofu, but with mushrooms. 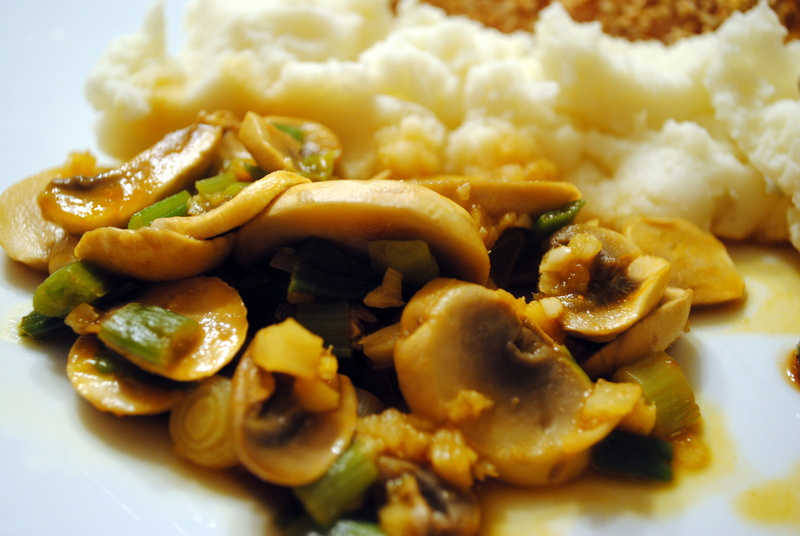 It was a great recipe that stood alone, but I could also see using these mushrooms as a sauce over tofu or even steak. Simmer mushrooms, ginger, garlic, and scallions in broth on medium high heat until the mushrooms are soft. Season with soy sauce, and pepper. Posted on November 1, 2011 by Clare Cooks! I picked up some turkey tenders from Trader Joe’s and honestly I wasn’t quite sure what to do with them. Turkey tenders are about the size of a chicken breast, so it probably would have been easiest to cook them like a chicken breast, but I really wanted something a bit different. I decided to cut down the turkey tenders a bit and try a chicken tender recipe. I probably should have cut the turkey a little smaller. While the turkey did turn out well, it certainly wasn’t the star of the meal. The coating, while nice and light, was definitely missing something. If I were to make it again, I would add garlic or onion powder to the sesame seeds, along with using something like sesame chili oil instead of regular sesame oil. Preheat oven to 425. Spray baking sheet with cooking spray. Combine the sesame oil and soy sauce in a bowl, and the sesame seeds, salt, garlic powder and panko in another. 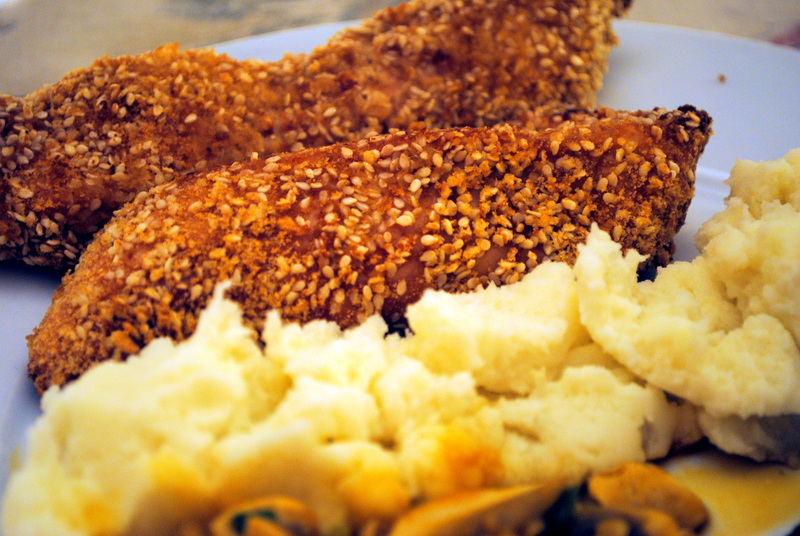 Place turkey or chicken tenders in the bowl with the oil and soy sauce, then into the sesame seed mixture to coat well. Place on the baking sheet; lightly spray the top of the chicken with oil spray and bake 8 – 15 minutes. Turn over and cook another 4 – 5 minutes longer or until cooked through. – NOTE: cooking time will vary if you are using turkey or chicken and depending on the size of the tenders. Posted on October 31, 2011 by Clare Cooks! This recipe is delicious. I love green beans, so I’m always excited to find new ways to serve them. These beans had the perfect blend of sweet and spice and were beyond tasty. I think that this sauce would be great with nearly any kind of vegetable you would want to sauté, like asparagus, onions, broccoli, bell peppers, or whatever else does it for you. 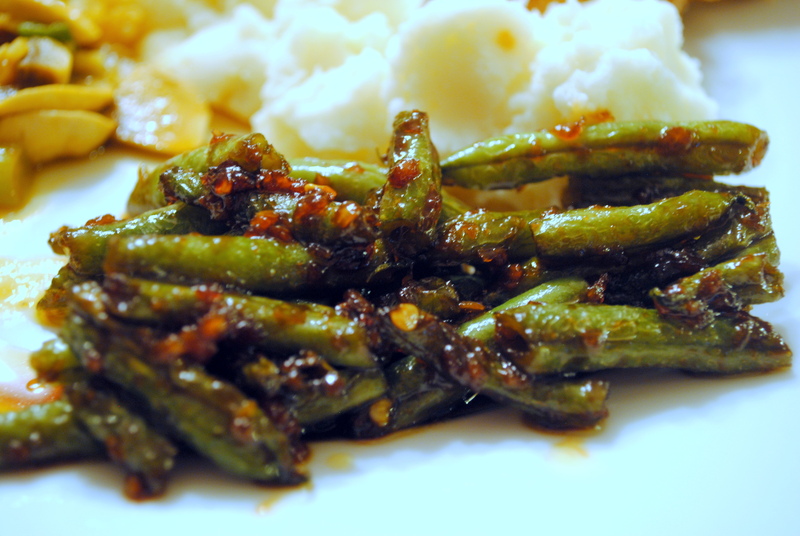 I served these green beans up with a vaguely Asian-inspired meal, but they would be a great side to spice up nearly any meal. They would be great with meatloaf or burgers and they are pretty good cold as well. If you can’t find chili garlic sauce, you can just use regular Sriracha sauce and add as much minced garlic as you like. And yes, I know I broke every rule of food photography in this one, but with the sun going down so early now, I have to start cooking dinner at 10 am to get good lighting. In the mean time, we will all have to just deal with horrible pictures. Luckily the recipe more than makes up for the photo quality.